Are stocks going up only because all the alternatives are lousy? We keep hearing the warnings about high stock valuations and possibility of market losses, poor returns, etc. I believe it, but every time I think about what to do about it, all the other choices stink, so I stay in stocks. And they keep going up for no good reason that I can discern. Cash? no return. Bonds? Little return plus rising interest rate risks. Commodities? Don't even ask. I'm beginning to think that the only thing stocks have going is that all the other choices are so lousy that nobody wants them. Under normal circumstances in the past, it seems to me that bonds would be paying enough interest that they would start drawing money away from stocks. Is this a "best of the worst" bull market? How long can this go on if the fundamental reasons to own stocks aren't convincing? Re: Are stocks going up only because all the alternatives are lousy? Standard Boglehead disclaimer, I realize I know nothing, so I keep investing according to my plan. However, if I was inclined to listen to my own suspicions, I would say we have expanded the money supply greatly, but the inflation monster is nowhere to be found. Perhaps increased wealth inequality means the increase in money supply is being funneled into things bought primarily by wealthy people, like stocks. So in a weird way inflation is being funneled into stock prices, where we call it stretched valuations rather than inflation. I agree a lot with your line of thinking. The Federal Reserve has kept interest rates at a historic low for a long time. I think this drives more money into the stock market because people are chasing returns. Good returns can't be found in cash or bonds. I also think this contributes to rising debt. The interest rate for loans is low. I tend to think of interest rates as the price of money. The price of money is cheap which results in more debt being taken on by Americans. I'm curious to see what the result of all this will be. Isn't an investment decision supposed to be based on yield? Is it logical that demand for stocks increase in a low rate environment? I mean, I think Bogleheads work off a different foundation to some degree, but I think economists would approach it from this angle? Also, is it a low rate environment because the Fed is keeping short term rates low, or is the Fed keeping short term rates low because it's a low-rate environment? My impression is that the Fed has wanted to raise rates for quite some time, but the economic conditions suggest that doing so would result in a recessionary decline. I think these things are easy to misunderstand, and I'm not sure of my own conclusions... which is why I stick to my AA and then let it motor me to retirement. I do hold 20% bonds though, because eventually stocks are going to stumble. I just don't know when though. I will sort of second this. A investments value is its discounted cash flow. The lower the discounted value use - a.ka. interest rate - the higher the value of that instrument is. We have low yielding long bonds. TIPS indicate the market expects inflation to be tame. Compressed yield spreads on corporate bonds and low a low Equity Premium indicates the market expects calm markets. I will point you to the "New Normal" and "Secular Stagnation". The theories in a nutshell state that low grown and a surplus of savings will depress returns for the next 30 years. A very interesting post, I hadn't thought of things this way before. Well, I named Garland Whizzer as the Chief Investment Officer of Bogleheads; now you might be in the running to be our Chief Economist. A good question to ask is this: what other things are wealthy people buying and what is the inflation rate on those presumably luxury items? Thinking of stuff like yachts, collectibles, fine art, etc. The answer would help confirm or deny your thesis. But anyway, congratulations on a thought provoking post. Good to see people putting their thinking cap on. When John Bogle was asked this question, he said yes but what are we going to do about. He said he does not know the answer. If he doesn't know I sure as heck don't. So, I will stay the course and invest for the long term. On a side note, during my investing lifetime, I was invested in the S&P during a ten year flat period. I will not deviate from my plan and leave bonds because even if they go down, it will be a blip compared to a stock market downturn. I am going to read the section in the Little Book of Common Sense Invest: "What Happens When the Good Times No Longer Roll". Personally, I'm starting to think about Buffett's "be fearful when others are greedy..." mantra, as I'm hearing more "novice" investors spouting off about how well they've done with this or that stock pick. As a devout Boglehead, I just keep rebalancing when my asset allocation calls for it. Unfortunately, we've run out of equity holdings to convert in our tax-deferred accounts, and are facing the prospect of exchanging stock funds for bonds in our taxable account. I'm retiring at the end of the year, so trying to hold off until I'm in a lower tax bracket (unless the inevitable correction intervenes first <g>). The market will pull back...as it always does. And then it will go up again. But consider that even a large (say, 10%) drop in SPX will simply bring it back to where it was in March, 2016. Which would still be double what it was in mid-2009. Personally I do feel that low bond yields are having an effect, but who knows when (or if) they will move back to historical averages. Bonds? Little return plus rising interest rate risks. Good returns can't be found in cash or bonds. Funny, I look at my portfolio and I see bonds that are up 6.2%, 17.7%, 14.4%, 13.1%, 9.0%, and 8.6%. Anyone who says bonds have little return right now doesn't know what they are talking about. 6. People tend to get confident over long term appreciation. And lastly, if stocks drop, say, 20%, wouldn't they keep going up after that? What bonds are you talking about? Those percents that you are quoting: over what period? 1 month? YTD? 1 year? 2 years? 10% is not a large drop. 50% is a large drop. All I hear about is how stocks are overpriced. The real question is: are there measurable criteria that show if: (a) overall public is more bullish, neutral, or bearish, and (b) if the uninformed part of the public is bullish, neutral, or bearish. Gold is also up 11.7%. I don't buy the argument of "there's nothing else worth investing in", especially we're talking about the market as a whole, not just Bogleheads who think any bond that isn't a US Treasury isn't a "real" bond. You can also throw in the YTD returns for things like PE and hedge funds to further broaden the investment choices of things that are doing well as alternatives to US stocks. Bonds usually refer to non-defaultable government securities, denominated in the currency that the government has control of. Everything else is considered credit. Also, in that list, looks like US Stocks are pretty much destroying everything else. There is loads of inflation in asset prices, just not in consumer prices. Perhaps this is because the expansion of the money supply didn't end up in the pocket of the consumer, but instead was used to recapitalize banks and buy bonds and mortgage-backed securities. There's a reason iShares, Vanguard, and everyone else in the world calls these things "bonds". Because they are bonds. I agree with your assessment of fixed income investments. Being retired, I'm frustrated by the low return of bonds. I believe one of the reasons for this prolonged bull market is the decline in defined benefit retirement plans. Those plans were typically 60/40 allocations. Most workers are now investing in 401k plans. Many of those plans offer target retirement funds that are typically 90/10 allocations for much of the worker's career. These funds buy stocks biweekly or monthly. It's a classic example of too much money chasing too few stocks. I understand that every buy requires a seller; however, I also understand that every seller will sell for the right price. Interest rates spiked up, in relative terms, after the election and have since gravitated back down about where they were before. So sure, YTD bond numbers look great as LT interest rates decreased. I imagine Q416 looked horrible. I generally agree with the premise of the OP. Stock valuations are high, but interest rates are very low. On a comparative basis you would expect higher PE values when you have near record low interest rates.The same thought has occured to me in terms of inflation - consumer prices are held in check due to technology, globalization, etc, but those things desired by the wealthier classes, which have done much better, like stocks, homes, etc, have had significant inflation, but they aren't inflation because they are investments, not consumable goods. While there is always a possibility of some unexpected shock that takes us in a tail spin, there is some decent historical evidence that after a financial based recession interest rates will stay low for quite a while. So with earnings continuing to hold up, lousy bond yields and no other good alternatives, stocks should continue to chug along modestly, at least until some sort of shock comes along - either geopolitical or economic. I've thought this for a long time. You see it in home prices too, especially those that are attractive to foreign investors. I agree with the ordinal poster that stocks are attractive due to how lousy the alternatives look. I'm struggling with those numbers. S&P is now over 2500. A 20% drop would bring it to 2000, which is triple the 2009 low of 666. This doesn't even account for reinvested dividends, which would add about another 16%. What am I missing? So the mindset, I think, goes something like this. Yes, market valuations are elevated, but, you know, low interest rates justify higher valuations. Besides, there’s really no alternative to stocks because you’ll get what, 1% annually in cash? Look at how the market has done in recent years. There’s no comparison. Value investors who thought stocks were overpriced in recent years have been wrong, wrong, and wrong again, and even if they’re eventually right, being early is just the same as being wrong. The best bet is just to invest in a passive index fund for the long-term, and ignore the swings. There’s really no alternative. What’s notable about this mindset is its excruciating reliance on three ideas. The first is that low interest rates “justify” rich valuations. The second is that market returns simply emerge as a kind of providence from a higher power, perhaps magical gnomes, or the Federal Reserve if you like, and that those returns have no particular relationship to valuations even in the long-term. The third is that market returns during the recent advancing half-cycle are an accurate guide to future outcomes. The problem is that this argument is the exact essence of a bubble mentality. Specifically, the mindset boils down to the proposition that stocks have gone up, and though valuations have become rich, stocks have continued to go up, so valuations must not matter all that much. And even if valuations did matter, low interest rates “justify” extreme market valuations while simultaneously offering no alternative to stocks. So market valuations are obscene because stocks have to compete with interest rates, but apparently, interest rates can’t compete with stocks. In effect, stocks are viewed as good investments because they have been going up, and the evidence that stock prices will go up is that stock prices have gone up. Every additional market advance makes stocks look even better, based on past returns. Indeed, the more extreme valuations become, the more convinced investors become that extreme valuations don’t matter. And that’s why we’re all gonna die. We are observing an episode that will make future investors wince. Just like the two closest analogs, the 1929 high and the tech bubble, I expect that future investors will shake their heads in wonder at the stark raving madness of it all, and ask what Wall Street could possibly have been thinking. Yes, sorry, I meant 20%, I did the math wrong. AlohaJoe is correct, there are lots of kinds of bonds, from Treasuries to Junk. On the forum, to generalize, when one refers to "bonds" one is usually referencing a fixed income instrument that has low volatility and low risk of default. So, not junk bonds but rather some type of gov't or high quality corporate bond or an index thereof. To generalize again, many forum members prefer to confine their more volatile assets to equities and use bonds for stability. One can certainly find more risky bonds if one is a yield chaser. "Wall Street finished the 1900s at an all-time peak Friday -- capping a century of unprecedented growth punctuated by two market crashes, the longest-running stock rally in history,"
Since my guess for the S&P 500 moved from 110th to 33rd in 6 days in the BH contest, it is a sell sign per my acquaintances. Interest rates are low and that usually means that investors will prefer stocks. The prospect of lower corporate tax rates may continue to help elevate the market. Perceived decreases in regulations may also help the bottom line of some corporations. I don't believe the market is completely efficient, but it is hard to take advantage of those inefficiencies anyway. I am staying the course which has been to slowly increase bond allocation in early retirement having won the game. Darn, you beat me I'm at 42nd. Maybe stocks are going up because alternatives are lousy. But that was not the case in 2000. Intermediate term bonds yielded something like 7% back then, but still CAPE reached >40. If low interest rates justify higher valuations, and the interest rates of the year 2000 brought the stock market to a CAPE of 40, this market can go a lot higher before it goes down again. This is bubble talk, of course. The decline may have started today. Nobody knows nothing. There is a lot of truth to what you said. Stocks look fairly expensive but so do bonds. Cash returns maybe 1% and Bonds 2%-3%. I have chosen to stay a bit stock heavy for this reason. Stocks are going up because earnings are good and the economy is picking up a bit of steam. Other than short term interest rates going up, intermediate and long term interest rates are little changed. We are not seeing the scenario of higher interest rates except at the short end of the yield curve. Inflation is also low. The third is that market returns during the recent advancing half-cycle are an accurate guide to future outcomes. What is an "advancing half-cycle?" 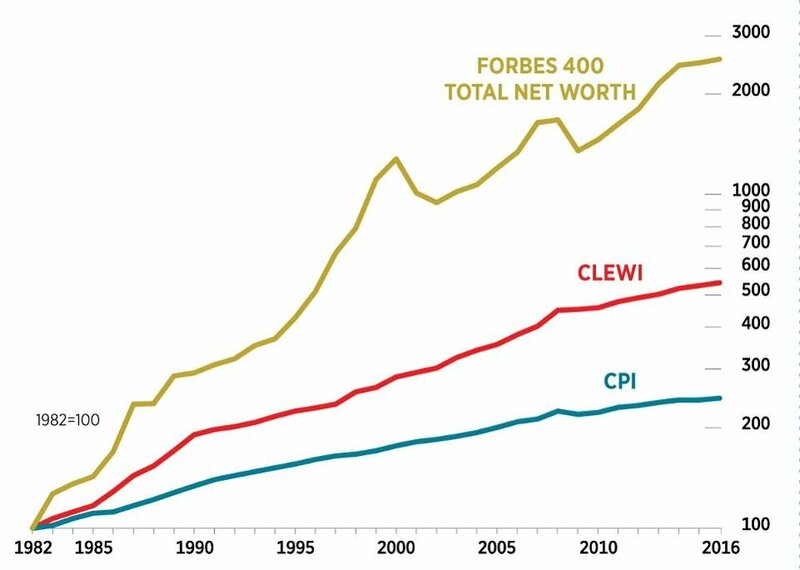 Forbes cost of living extremely well index (Clewi) seems to show that inflation of luxury products is outpacing regular inflation and has been for years. However there doesn't seem to be a huge spike when the fed started expansion of the money supply 8 years ago. - Warowits, Bogleheads Chief Economist and Professor Emeritus at the University of Drunken Googling. Last edited by warowits on Fri Oct 06, 2017 5:24 pm, edited 1 time in total. The monetary base has exploded in the last 7-8 years. I don’t know if stocks and bonds are in a bubble or not. But my 83 year old father reminds me that all through the 1950s, “they” kept waiting for the Depression to return as stocks climbed the wall of worry. 1) They don't keep going up. Sometimes they go down. But it is a random walk and the direction is unknowable apriori. 2) There are many thousands of reasons each day: buyers and sellers meeting in the agora, many doing their own individual calculus of a company's price, and dividing by shares outstanding. 3) If you are hoping to find 'A NARRATIVE', one main story, of why stocks went up or down today (or this week or this month or this quarter) you are misguided. There is too much going on, and knowing about it, in the moment is, very very difficult. OCCASIONALLY there will be a story (financial crisis, sudden change in politics/financial policy, crowd behavior, natural disaster, some big unexpected something-or-other,) but USUALLY the correct narrative only emerges much later. The stories in the news or your head about what is happening today or this week or this quarter are invariably incomplete, inaccurate in many ways, and not really helpful. Over the short run, prices are less accurate, but over longer periods of time - it averages out to something. And only in the future will we know how accurate today's price is - as later confirmed by the LT price history, by mergers and acquisitions, LBOs, additional information. Find an asset allocation you can stick to over the long run and be comfortable with that. You have a good sense of humor, I chuckled when I saw the title you gave yourself. In our economy, debt is money. Indeed our currency says Federal Reserve Note, which means a greenback is really a zero interest loan. When more debt is created in the economy, the money supply is increased. One factor in increasing money supply is an increase in the Federal debt. Pretty much, when the public sector runs deficits, the private sector is in surplus. This is one reason that we saw fantastic corporate earnings in the aftermath of the financial crisis. We also saw savings rates go from about zero to five or six percent. Corporations had high levels of cash on their balance sheet. Since the financial crisis, our national debt has gone up from $8 trillion to $20 trillion. Another thing to consider is that individuals bought a lot of treasuries, money went from savings accounts to buy treasuries. Pretty much a shift from one pocket to another. Certainly, increasing the Federal Debt is a factor in money creation but less of a factor than the Fed buying bonds on the open market. Probably the biggest factor in money creation is the money multiplier effect through the private banking system. The Federal Reserve Bank can create money out of thin air by buying bonds and thus injecting cash into the financial system. Historically, the Fed would buy treasuries when it wanted to increase money supply but with quantitative easing also purchased mortgage backed securities. The Fed increased its balance sheet from about one trillion (I am going by memory here) to about four trillion. There is also the multiplier effect in the private banking system, where banks can lend out $10 for every $1 in deposits. In theory, decreasing reserve requirements for banks increases money supply as it makes more deposits available to be leveraged to up to a 10:1 ratio. In practice, I have read that bank reserves have nothing to do with lending or money supply. In effect, a loan created by one bank creates a deposit at another. Private banks can create money out of thin air too but with limitations imposed by the Fed and regulators. The Fed in effect sets short term interest rates, low rates encourage lending and high interest rates discourage lending. The most dramatic example of this was when Paul Volcker hiked short term rates to about 14% and this pretty much stopped mortgage lending. So Fed interest rate policy indirectly affects the money creation in the private banking system, an indirect but a potentially dramatic effect. So add $12 trillion in additional Federal Debt since the 2008-2009 financial crisis plus an additional $3 trillion added to the Fed Balance Sheet. Well, pretty much the Fed bought $3 trillion of the additional $12 trillion of the National Debt, so that leaves us with $9 trillion. Another factor is that a lot of private debt was destroyed during the financial crisis and its aftermath and one could say that we mostly swapped Government debt for Private debt. This was a big reason that we didn't experience a second Great Depression. In the aftermath of the financial crisis, bank lending was pretty constricted, we went from loosey goosey lending standards to pretty tight lending standards. So the money supply increased a lot by not nearly as much as one would think at first glance. I also recall that the Fed had another trillion dollars on deposit from its member banks as reserves. Larry Swedroe commented that the velocity of money was pretty slow after the financial crisis. A big factor was that lending from the private banks was pretty constricted. There was a lot of money created but much of it just sat around in bank reserves. Having said all of this, I would say that there is disagreements on how money is created and even on the definition of money. If you read Warren Mosler, it is mostly a function of government debt. That sheds light on the issue but it seems like an incomplete explanation. The Fed plays a big role as it can change the climate for private bank lending by changing the level of short term interest rates. The Fed can inject money into the system by buying bonds and can take money out by selling bonds. From what I have read, it seems that the private banking system has the largest role in money creation. Cullen Roche has a good explanation in his blog Pragmatic Capitalism. But I suppose his model has flaws. Not sure anyone 100% understands how it all works but we mostly know. A huge factor is public confidence. There definitely was a lot of money created in the aftermath of the 2008-2009 financial crisis but public confidence was low. People were scared and reigned in their spending. Also, personal debt was very high and this also constricted people's ability to spend. In this environment, it was tough to stimulate the economy. Last edited by nedsaid on Fri Oct 06, 2017 6:36 pm, edited 1 time in total. I know other factors are involved but your graph corresponds pretty well with the increase in the Fed's balance sheet from $1 trillion to $4 trillion. I disagree. Every investment bank, trading firm, and other financially connected institution calls those "credit". As I read your post it occurred to me that it is an excellent description of why low rates cause bubbles. The low rates leading up to the financial crisis created a demand for mortgage backed securities. The result of that was ultralow rates and QE. Eight years later we still have ultralow rates and QT now. How this all plays out has been, and is going to be fascinating to watch. Leading up to 08 you would have thought that the economy would have been much stronger with all the lending and money creation going on. But it wasn't strong it was just so-so. Maybe it ends the same way just a so-so bubble collapse. Nothing unprecedented or out of the ordinary. In our economy, debt is money. As we explained in our earlier piece on earningless bull markets, because the corporate sector does not issue sufficient amounts of new equity each year to keep up with the continually increasing supply of cash and bonds, stock prices have to rise over the long-term. If they don’t, stocks will become a smaller and smaller percentage of the aggregate investor portfolio. Another piece in the puzzle (supporting the OP's hypothesis) is that investors who want to keep expected return constant when interest rates are falling (expected=certain future return of fixed income goes down) have to shift to higher-yielding (read higher-risk) investments. E.g. it was in the news some time ago that the Norwegion Oil fund (portfolio now nearing 1 trillion) wants to increase equitiy allocation from 60 to 70 percent in order to compensate for lower bond yields. https://www.ft.com/content/434931cc-f46 ... 76151821a6 (Google "Norway plans shake-up of $900bn oil fund" to get around the paywall). Could well be the "normal new", or maybe it's a big bubble. Even if you had a very good understanding of all this, with governments messing with the money supply all around the globe and all the other uncertainties, you're back to square one in predicting anything. The only reasonable thing to do is stick to simple heuristics that have worked over time: use a simple, diversified portfolio and stay the course. Nedsaid: My sense is that this is a cyclical phenomenon. In the United States, Sarbanes/Oxley and all the required disclosures probably discouraged companies from going public in the first place and also likely encouraged public companies to go private. I did see an article somewhere, perhaps it was Larry Swedroe, that the returns of private equity have been declining. A relentless upward pressure in stock prices caused by a shortage of publicly traded stock might encourage companies to start going public again. I suppose this might be the ultimate "sell" signal but that is another discussion. Very interesting point. Nedsaid: I have been a little more stock heavy than I would like because of the very low interest rates. But I don't think it is a good strategy to keep ramping up the risk in order to keep returns constant. Many people are doing precisely that but at age 58, I want to tone down volatility and not increase it. Plus, we forget that stocks are pretty darned risky, bad things can happen. We are starting to forget the 2000-2002 and the 2008-2009 bear markets, which both saw stock price declines of 50% or more. Nedsaid: Hence the big interest in alternatives about which I have my doubts. My take is that investors increase their allocation to International Developed Stock and International Emerging Stock Markets. Cheaper prices and higher future expected returns. I would do a shift between US and International stocks rather than just blindly increasing stock allocations. Interesting statement from Warren Buffett re: investing in bonds. His horizon of the last 50 years would include 1965-2016, which encompasses some pretty rough times for the stock market and the giant gains from Treasuries after interest rates started down in 1982 -- yet he says it would have been safer to have been in U.S. equities than in Treasuries.